Well, now that spring has arrived, it’s time for Congress to get around to passing the 2018 budget that was due in time for the start of the fiscal year last Oct. 1 — that is to say, nearly two seasons ago. Yes, we went through all of winter, most of fall and a couple of days of spring before Congress got around to cobbling together a spending bill. 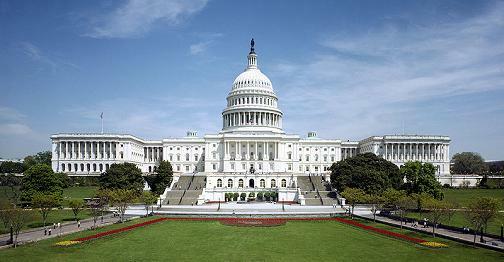 On Wednesday, the House released a $1.3 trillion omnibus bill that is 2,232 pages long. They say good things happen to those who wait; in this case, that patience may well pay off for NASA (not that the agency any choice in the matter). The space agency’s budget would be boosted to $20.7 billion. The budget would be $1.1 billion above the $19.6 billion NASA received in FY 2017 and $1.6 billion above the $19.1 billion the Trump Administration proposed to spend in FY 2018. I haven’t had time to fully review it, but the budget basically rejects most if not all of Trump’s proposed cuts to the agency, including Education, Earth Science and the Wide-Field Infrared Survey Telescope (WFIRST). 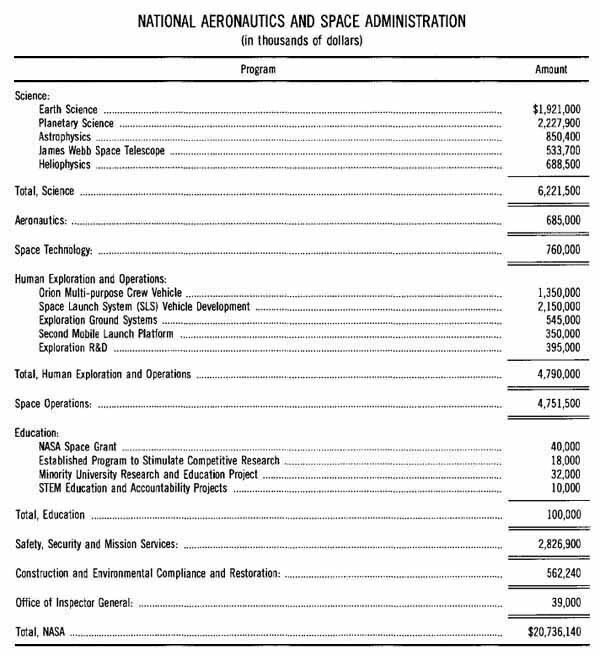 Below are details of the space agency’s budget budget taken from a House document. This Act includes $20,736,140,000 for the National Aeronautics and Space Administration (NASA). This Act includes $6,221,500,000 for Science. The agreement reiterates the importance of the decadal survey process and rejects the cancellation of scientific priorities recommended by the National Academy of Sciences decadal survey process. Earth Science. – This Act includes $1,921,000,000 for Earth Science. This amount includes $147,000,000 for the Plankton, Aerosol, Cloud, and ocean Ecosystem; $17,000,000 for the Climate Absolute Radiance and Refractivity Observatory Pathfinder; $1,700,000 for the Deep Space Climate Observatory; $9,700,000 to launch the Orbiting Carbon Observatory-3; $55,400,000 for the NASA-Indian Space Research Organization Synthetic Aperture Radar Mission (NISAR); and $175,800,000 for LandSat-9. Earlier this year, NASA terminated an Earth Science instrument scheduled to be launched on the Joint Polar Satellite System (JPSS)-2 satellite. NASA is directed to preserve the significant investment made to date when closing out the program and to retain appropriate options to utilize the instrument in the future. Further, NASA shall report to the Congress within 180 days of the enactment of this Act on plans to ensure the collection of energy budget data beyond the JPSS-1 Clouds and the Earth’s Radiant Energy System (CERES) instrument. Planetary Science.- This Act includes $2,227,900,000 for Planetary Science. Of this amount, $595,000,000 is for the Europa mission, including both the Clipper and Lander components. The agreement also provides $66,000,000 for Near Earth Object Observations as directed by the Senate. The agreement provides up to $335,800,000 for Discovery and up to $90,000,000 for New Frontiers. Within amounts currently available in the Planetary program and from funds provided in this Act, no more than $35,000,000 is for the Near-Earth Object Camera (NEOCam) mission to complete a system requirement review and mission design review, and associated follow-up work. Also included is $660,000,000 for Mars with language clarifying House direction to support the Mars Sample return mission and Orbiter, as appropriate. The agreement also provides $23,000,000 for the Mars helicopter technology demonstration activity. The agreement modifies House language regarding an Exoplanet Exploration Decadal Survey to acknowledge that this matter is being explored in a February 2018, National Academy of Sciences call for White Papers: Exoplanet Science Strategy in advance of the upcoming decadal surveys in astronomy, astrophysics, and planetary science. Astrophysics.- This Act includes $850,400,000 for Astrophysics. The agreement clarifies House language regarding a competitive, principal investigator-led astrophysics program to direct that this matter be addressed in the upcoming 2020 Astrophysics Decadal Survey. The agreement provides $98,300,000 for the Hubble Space Telescope. The agreement also includes no less than an additional $15,000,000 for exoplanet technology development, including search for life technology development and starshade technology development. review of this program. The agreement notes that SOFIA, which began its prime mission in 2014, has a prime mission lifetime of 20 years. Wide-Field Infrared Survey Telescope (WFIRST).- In lieu of House and Senate language regarding WFIRST, the agreement includes $150,000,000 for WFIRST, which is the highest priority of the 2010 Astrophysics Decadal Survey. In October 2017, NASA received the findings from the WFIRST Independent External Technical/Management/Cost Review (WIETR), which found in part that the current science management strategy is appropriate and that the Class B risk classification for the WFIRST mission is not consistent with NASA policy for strategically important missions with comparable levels of investment and risk, most if not all of which are class A missions. Accordingly, NASA shall provide to the Committees within 60 days of enactment of this Act a preliminary life cycle cost estimate, including any additions needed to achieve Class A classification, along with a year by year breakout of development costs. James Webb Space Telescope (JWST).- This Act includes $533,700,000 for JWST. Heliophysics.-This Act includes $688,500,000 for Heliophysics. This Act includes $685,000,000 for Aeronautics. Innovative nanomaterials.- The agreement provides $5,000,000 to address challenges associated with large-scale production of advanced nanomaterials for use in NASA missions. directs NASA to provide, as part of its operating plan submission, a financial plan that breaks out funding and activity responsibilities for the office across the agency. The bill provides an additional $350,000,000 for launch capabilities and infrastructure associated with constructing a second mobile launch platform, as recommended by the Aerospace Safety Advisory Panel, which will enable an acceleration in the launch schedule for Exploration Mission-2. The funds also will allow flexibility for future NASA and other Federal agency missions that will require heavy-lift capabilities beyond those of current launch vehicles as well as enable a sustainable Space Launch System (SLS) launch cadence. The agreement also provides $395,000,000 for the Human Research Program and Advanced Exploration Systems, including no less than the current operating level for these programs. Space Operations. – This Act provides $4,751,500,000 for Space Operations. The agreement maintains the fiscal year 2017 levels for the 21st Century Space Launch Complex program within this account as directed by the House. The agreement adopts the Senate funding recommendation for and language regarding Venture Class Launch Services. This Act includes $100,000,000 for Education, including $18,000,000 for the Established Program to Stimulate Competitive Research; $40,000,000 for Space Grant; $32,000,000 for the Minority University Research and Education Project; and $10,000,000 for STEM Education and Accountability Projects. The agreement adopts Senate language regarding future placement of this program and direction regarding administrative costs. This Act includes $2,826,900,000 for Safety, Security and Mission Services. The agreement modifies House language regarding submission of reports from NASA pursuant to National Academy of Public Administration, the GAO, and the NASA Inspector General reviews of NASA security compliance protocols and foreign national access management and directs that these reports be provided yearly. This Act includes $562,240,000 for Construction and Environmental Compliance and Restoration. Funds provided above the request are to address maintenance and repair backlogs. This Act includes $39,000,000 for the Office of lnspector General. It’s why President Washington gave his warning about the evils of political parties running government. What can you say? The Republicans are back in power, which means reckless tax cuts and over the top spending that doesn’t add up. Just like Reagan and Bush the Second. Bush the First bucked that trend and faced a revolt in his own party. Clinton presided over surpluses. Obama ran up deficits, but he faced a collapsing economy where the suffering would have been vastly worse without pumping money into it. He responded to dire circumstances. It is sad that instead of working to find common ground that will benefit all America, members of each party are doing their best to split America by demonizing those of the other party. Most Americans, like myself, are simply sick of folks from BOTH parties pointing at the other party claiming they are “evil” and “wrong” simply because they have a different opinion on an issue. The Clinton surpluses were due to cuts in military spending pursuant to the collapse of the Soviet Union and a Republican House majority from 1994 onward that kept Mr. Clinton’s drunken sailor tendencies in check. It would be nice if today’s Republican House majority were comparably abstemious, but so it goes. The one thing guaranteed is that both spending and taxes would be higher under a Democratic administration with a Democratic Congress. That was the case in the first two years of the Obama administration which is also when the deficits were worst. The “dire circumstances” were the result of Clinton-era policies that Bush was unable to derail. Obama’s reaction to them didn’t fix matters, it just stretched out the bad times to nearly a full decade. Mr. Obama got his wish to be FDR 2.0 and, like his predecessor, presided over his own Great Depression. Both Bush the First and Clinton the Only raised taxes in order to get Reagan-era deficits under control. They paid a political price for these decisions. Bush the Second’s economic mismanagement speaks for itself. Blaming it all on Clinton is avoiding responsibility for very poor decisions made by the firm of Bush, Cheney, Rumsfeld & Rice. Large tax cuts, two major wars and a lack of Wall Street regulation are not a good combination. Trump is pursuing two out of three thus far. We’ll see if Bolton and his mustache make it 3 for 3.